Beagle Dogs - The Beagle is a medium-sized dog breed and a member of the hound group, similar in appearance to a Foxhound but smaller with shorter legs, and with longer, softer ears. 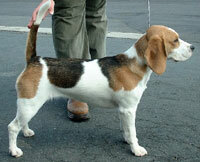 Beagles are scent hounds used primarily for tracking deer, bear, and other game. They are a loyal breed and most often very well tempered. Beagles love exercise and being around people. The Beagle has a very good temper and gentle disposition. Beagles are intelligent, but are stubborn and may be hard to train due to their strong will, which is common in the breed because of its curiosity (especially for scents). However, if a newly-acquired puppy has a dominant master in control, they can be easy to train and can obey basic commands. They are an especially loyal breed and are very friendly. This information is licensed under the GNU Free Documentation License. It uses material from the Beagle article on Wikipedia.org. 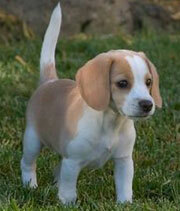 Beagle Breeders - Advertise your kennel puppies and dogs here.